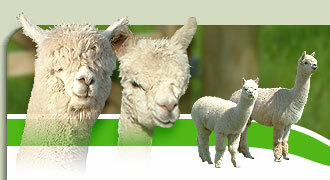 Alpacas come in two varieties - huacaya and suri. Huacayas are the more popular and have a shorter, closely crimped dense fleece. In suris the fleece is much longer and hangs down the sides of the animal in ringlets. Alpacas are hardy; so vet bills tend to be small. They need minimal maintenance; toenails 3 to 4 times a year, plus half-yearly faecal egg counts, worming when necessary, Fluke treatment and vaccinations. We can show you how to do these simple tasks. They need grass for grazing (about 5/6 per acre), hay ad lib throughout the year and a small quantity of feed supplement to encourage gentle handling. They are easy to overfeed so take care not to! 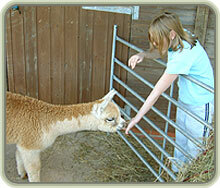 Standard stock fencing is perfectly adequate for alpacas, as they seldom challenge fences. You should avoid barbed wire, replacing it with plain wire if possible. Catch pens make capture for husbandry and training much simpler. Get hold of a quantity of hurdles for this you can never have enough. The fibre produced by alpacas is of exceptional quality, but the fleece market is still developing in the UK, so it is a good idea to have a range of alternatives in mind when considering your outlet for the end product. 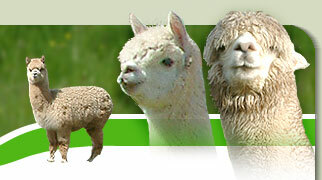 Alpacas need to be sheared annually. In the UK, alpacas are not generally farmed for meat, so your animals will be around for 15 to 20 years, lots of time to get to know them and enjoy their restful qualities. Because they have pads rather than hooves, they are gentle on the land, so no poaching in winter. They are very hardy and usually prefer to be outside all year, although a field shelter provides protection from strong summer sun and the very worst of our wet weather. Alpacas are induced ovulators - they don't come into season. The act of mating with a male (macho) induces the female (hembra) to ovulate, so you can manage the timing of births if you choose to. Most breeders prefer to time births for the spring and summer, when grass is plentiful and the offspring (cria) can get some sun on their backs. Birthing is usually easy - morning deliveries after 11 ½ months gestation. 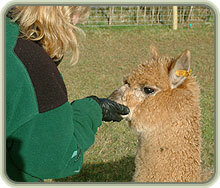 Allow a couple of weeks either side of the due date as alpacas seem to have an ability to birth early or late at will. 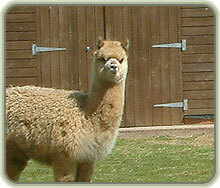 A single cria is produced - twins are exceptionally rare. Our best advice to anxious new owners is to read up all you can about the birthing process, have your vet's phone number to hand, make a cup of tea and leave it to the alpacas - they invariably manage without any intervention.